The identification of people’s talent and the realization of their full potential are key objectives in human resource management globally. Developed and emerging economies and societies strive to achieve these mainly through the school system and primarily with the involvement of universities. It is one of the central missions of our university as well to find talented students and help them improve their talent. This is not only a nice task and endeavor of the university but also its primary interest and something expected by society as well, thus it is increasingly present on all levels of education and in all scholarly programs. Talent management, preparing students for an academic career, and training the future generations of scholars are all interconnected at the university. 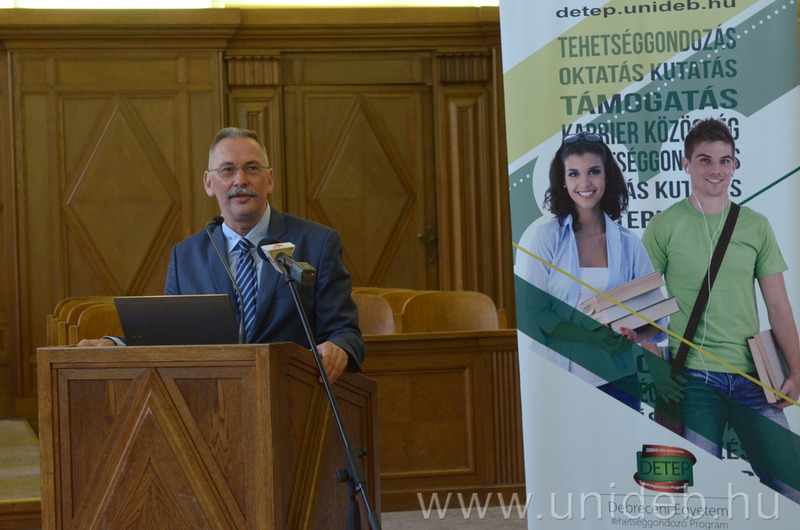 The Talent Management Program of the University of Debrecen (DETEP), together with the city, has been an innovation center and stronghold of talent management in Hungary for decades. With its diverse academic programs and wide range of scholarly fields, our university is practically involved in the all the disciplines available in Hungarian higher education. Those who are interested in research and scholarly affairs and would like to gain a deeper understanding of particular research areas than what is offered by required courses. According to the regulations of the program, all active full-time and part-time students who have not interrupted their studies for a period longer than two semesters and who have at least two completed semesters. to help the most talented students in becoming university instructors/researchers and educate the new generation of scholars. an advantage when applying for grants. What do students do in DETEP? Research work with the help of supervisors and based on an individual work plan. DETEP integrates scholarly students’ circles, colleges for advanced studies, and self-study groups. Students have to register for the program in the Neptun administration system, sign up for a so called consultation credit offered by the supervisor. This has to be completed as a prerequisite for staying in the program. the attention of those in the colleges for advanced studies is specifically called to this opportunity but admission is not automatic. Research is carried out by students at the departments with the help of a supervisor. Department activities are coordinated by the faculty committees of DETEP, with the vice dean for educational affairs as a chair, the faculty coordinator (usually the head of the faculty’s scholarly student circle), the representative of the college for advanced studies and that of the student union, and others invited by the faculty as members. The governing body of talent management is the Talent Council with the current Vice Rector for Scholarly Affairs as its chair. At the beginning of each calendar year students can apply for DETEP scholarships. Those with outstanding scholarly accomplishments (performance) in the previous year can apply. Scholarships can be awarded only for such accomplishments and not for consultation or educational credits. Evaluation takes place on three levels: formal (Directorate of Academic Affairs), contents (faculty committees), and final approval (Talent Council). Uploads accepted in METISZ (online publication management system) are automatically converted into performance credits in Neptun. Given to those graduating students who have completed the consultation credits during their enrollment in the DETEP program. Certificate + report on performance credits received for accomplishments and credits registered for. Can be an advantage when applying to the Master’s or PhD programs.